I’m a self-professed charcoal grilling and barbecue enthusiast and it seems like I have always owned a Weber Smokey Joe grill. In fact, recently I bought a brand new model because I really had to have the latest and greatest. I love the size of this grill because it allows me to pack it up and bring it on vacation or off to the beach for the day. 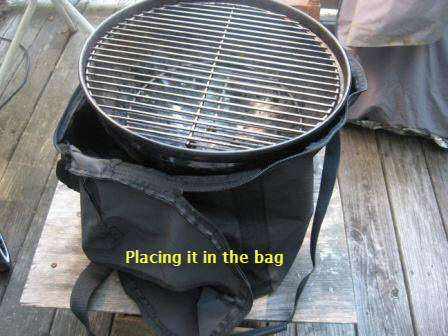 In the past, I would always pack up the grill in a trash bag before I placed it in the back of our car. 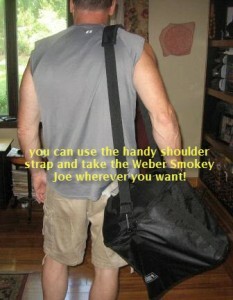 That is, until I saw the Weber Smokey Joe Bag that is made specifically for my favorite grill. 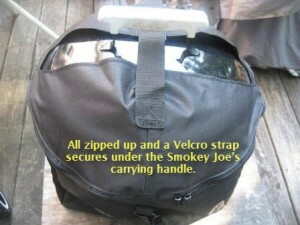 I was very excited when I saw this specialized Weber Smokey Joe Bag on Amazon. The way I looked at it was that I had the grill, so I might as well purchase the handy carrying case. As is typical with all Weber grill accessories, it is very well made. The design includes a zipper at the base of the grill cover which makes it very easy to zip up. There is a clever opening for the grill cover handle and a Velcro strap (see images below) which stretches between the top of the grill and the handle. 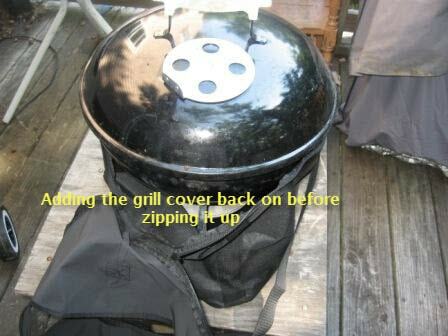 This strap allows you to carry the grill from the grill cover handle and the bag remains secure covering the grill. I like to use the handy luggage strap to carry it but being able to just pick it up by the handle is very convenient especially if you just want to move it a short distance. This bag also came with a bonus carrying case for my grilling tools. For the money, I think the grill carrier including the bonus tool case is a great deal for the grilling enthusiast. Even if it didn’t include the case for my grilling tools, it’s a great value. It's so exciting to be able to have a specialized carrying case for my Weber Smokey Joe but, then again, I'm a certified maniac when it comes to grilling! Padded shoulder strap allows you to transport grill easily. Grill inserts easily into the bag and handy zipper and Velco strip secure it. 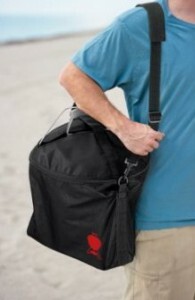 Bag allows you to take grill with you to the beach, camping, or tailgating. Bonus barbecue tool storage pouch included. 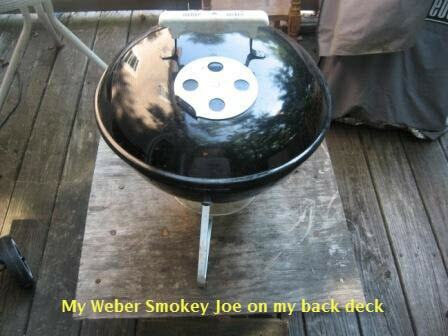 Fits Smokey Joe Silver and Smokey Joe Gold charcoal grills. If you own a Weber Smokey Joe grill, you have to invest in this handy Weber Smokey Joe bag. The Smokey Joe is a tremendous Weber tailgate grill and the handy grill carrier makes it that much easier to take it with you on the run. I love it and use the bag all the time. I always brought my Weber Smokey Joe with me travelling in the past and this bag just adds to its portability. Don't forget that it also comes with a pouch for your grill accessories. If you have any questions about the Smokey Joe bag or anything else on this site either leave it in the comments or use my Contact Us page.